Frisco, Colorado offers a winter wonderland of activities and is only about a 1.5 hour drive west of the major metropolis of Denver. Close to 6 major ski resorts and at the center of Summit County, this small mountain town draws crowds from all over to witness the beauty of the Rocky Mountains. The area also has a fairly long winter season and typically receives snowfall October- May. The majority of travelers are skiers and snowboarders, which leaves plenty of unexplored terrain for us snowshoers. Within the town of Frisco is Frisco Adventure Park, which offers dedicated space to experience a multitude of winter activities in one single day. 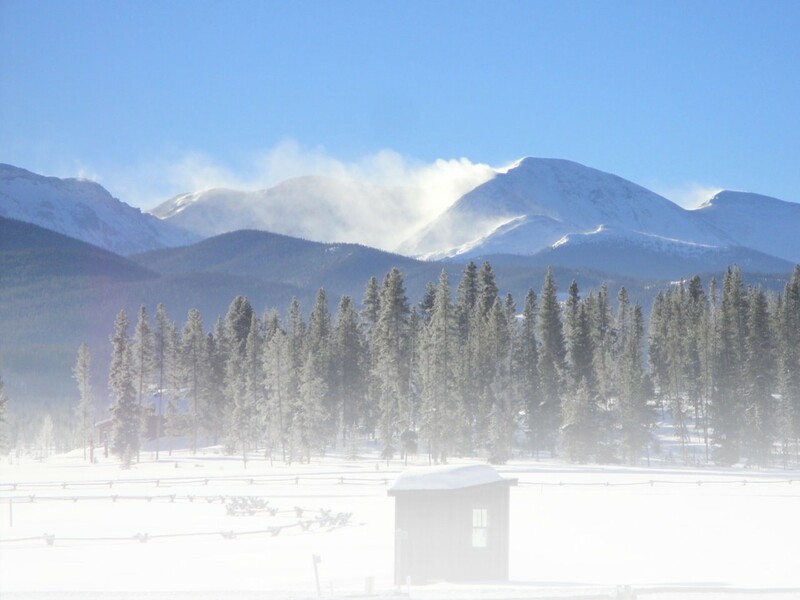 The Frisco Nordic Center at the park has 27k of ski trails and 20k of snowshoe trails on site. They also have equipment rentals available, if you don’t have your own. A daily trail pass costs $25 for ages 13-64 and $20 for those over 65. Kids under age 12 can explore the trails for free. There are two snowshoe specific trails available to use: Chickadee Ridge and Snowshoe Hare loops. Chickadee Ridge is an excellent 2.5 km beginner trail, and perfect for testing out the sport of snowshoeing. For more advanced snowshoers, the 4.5 km Snowshoe Hare loop may provide more of a challenge. Several tours are offered throughout the season, if a guided tour is more of your style. The Nordic Center offers afternoon tours every Saturday and Sunday from 2:00-3:15pm. The tour costs $50 for adults and youth over 12 years old, and includes a trail pass and snowshoe rental. I went on the Nordic Center’s 1 hour Snowshoe Tour and Dinner, which includes a guided tour and refreshments. With a group of approximately 15, we snowshoed 2 miles along the fat bike trail in the park. Before embarking on the tour, our group was fitted with local Crescent Moon snowshoes, poles, and headlamps (included in the cost). Both of our guides, Malin and Gunnar, have several years’ experience snowshoeing. Malin actually mentioned that she has been a guide for 4 years. They noted that sometimes, they’ll have travellers come on the tour who are seeing snow for the first time! No matter one’s experience with winter, snowshoeing can be a great entry level sport into the realm of winter sports. This is the case because you can push yourself to your own comfort level of activity. Along the tour that evening, Gunnar and Malin pointed out interesting sights and shared some fun facts with the group. Personally, I love learning about nature and its intricacies, so this was my favorite part of the excursion. Within our first 10 minutes on the trail, we noticed animal tracks, including snowshoe hare tracks (how fitting!). We learned from our guide Malin that the snowshoe hare actually puts their front feet behind the rest of their body to move forward. Hence, their tracks look like snowshoes! However, if you see the snowshoe hare in the summertime, you’ll want to look out for a brown hare, since they only turn white in the wintertime. You may see tracks of other animals on the trails as well. We saw scuffle marks in the snow, potentially those of a coyote and his/her prey! In addition to animal tracks, we stumbled upon a grove of young Lodgepole pine trees, re-growing after a fire in the area several years ago. Fire for the Lodgepole pine is actually a helpful tool though, as it uses heat to reproduce and open the blossoms of the tree. Trees in this area have experienced a number of calamities in addition to fire, like the pine beetle. Unfortunately, the pine beetle is tough to get rid of when it sets in as it can survive temperatures as low as -40 inside the tree! After our tour around the area, we returned to the Nordic Center and had drinks and an absolutely delicious snack of ginger carrot soup, bread, and dessert provided by Food Hedz World Cafe. The Snowshoe Tour and Dinner is $65 for ages 21+, and $45 for those under 21. To experience this tour and the trails of Frisco, check out Frisco Adventure Park for yourself! Thank you to Frisco Adventure Park for having us on the tour! As always, the views expressed in this article and of the experience are entirely my own. This entry was posted in Destinations, Features, Homepage Featured, New Colorado, New Destinations, New North America, New Site, New United States, News, United States by Susan Wowk. Bookmark the permalink. I was amazed to learn that the pine beetle can survive such low temperatures.